I’ve previously mentioned my dissatisfaction with historians (IMO) wrongly trying to fit historical events into a favorite model. We all(I’m going outside history here – this applies to all disciplines) have our pet theories about various things but just because we find a model valid and useful, it doesn’t have to be universal and there’s no need to try to shoehorn items which don’t fit into it. A few outliers does not invalidate a model or theory. Most importantly, evidence should be looked at and evaluated on its own terms, without contamination from other evidence, models or, as much as possible, our own preconceptions (this last is the hardest for me). Ann Marie Yasin includes an article, “Reassessing Salona’s Churches: Martyrium Evolution in Question” which calls into question, not the model itself (not completely anyway – see below) but the propensity of historians to assign an evolutionary process to a model, even when the evidence doesn’t support it. In this case, the model is the development of churches centered around the tomb of a saint or martyr. “The accepted model for the birth of Christian sacred architecture traces a line of evolution marked by successive stages of increasing monumentality: martyr’s tombs were transformed from ‘ordinary’ graves to small shrines, and then from modest cult centers to focal points of large, communal basilicas.”(63) While the specifics, including the number of intermediate steps, will vary, in essence this model states that what was once a martyr’s or saint’s tomb becomes a church with the tomb as a centerpiece. In this article Yasin chooses to focus on three archaeological case studies from Salona, in what once was Dalmatia. Salona is useful for this purpose as, “… more recent scholarship regularly treats Salona’s burial churches as ‘textbook’ cases of martyrium development and deploys them as models with which to reconstruct the architectural developments at other sites.”(62) Salona has a fairly large number of churches housing relics, with substantial remains available for archaeological examination. Marusinac is an interesting case where historically, hagiography has been used as the authoritative source for the development of the site, rather than relying on archaeological evidence. Based on a later (possibly tenth-century) text, the area was originally the rural dwelling of a wealthy family which included a cemetery. According to the text, Asclepia, a wealthy member of the family, interred the remains of Anastasius (martyred under Diocletian at the start of the fourth century) and was later buried nearby with her husband. The martyr’s tomb inspired the development of a cemetery area around it and later his remains were translated to a church built on the site. Unfortunately, archaeology does not support this, according to Yasin, “The reading [hagiographic tradition] does not grow out of the material remains uncovered at the site so much as form the framework into which the archaeological evidence has been inserted. This triumphant, evolutionary narrative of cultic and architectural monumentalization thus prescribes rather than describes (my emphasis) the evidence …”(94). There is considerably more evidence for this site which Yasin discusses but the above is the essence of it; archaeologically, there is no basis for considering Marusinac to be a Church built due to the presence of a martyr’s relics. Instead hagiographical tradition has been used to provide a framework of development which fits with the martyrium evolutionary model. As with Kapljuč, there is not enough evidence to say with certainty that Marusinac’s development didn’t follow this model, however there isn’t enough to state that it did either. NOTE: OK, I’m embarrassed. I just did a search of Bill Caraher’s Blog to get the link for his review/summary of Yasin(2009) to include in note 3 and came across his discussion of this very article. So I suggest you read it and, where he and I disagree, if we do – as I’ve just spent three hours putting this post together I’ve obstinately decided not to edit mine but to post it and THEN read his – you should probably go with him. In my defense, I did mention that I was behind on reading blogs. 1 I’ll apologize for the length here rather than in the text. Initially I was only going to look at Yasin’s argument for one of the sites but this will allow me to expand on and summarize my notes. This very well may be more useful to me than readers but one of the functions of this blog is to include information I’ve come across so I can come back to it later. 2 Chris Wickham’s Framing the Early Middle Ages: Europe and the Mediterranean, 400-800. Oxford: Oxford University Press (2006). ISBN: 9-780199-212965. was the first to show me that regional development must be examined independent of other regions and without preconceptions. Guy Halsall took this one step further for me in Barbarian Migrations and the Roman West, 376-568. Cambridge: Cambridge University Press (2007). ISBN: 978-0-521-43543-7. He provided a statement I haven’t forgotten related to possible Barbarian settlement in Roman regions, “The archaeological data permit no association of these graves with trans-Rhenen settlers. Without assumptions based on the simplistic use of written sources no archaeologist would assume these were the graves of immigrants.”(159) Every now and then I read something which wakes me up, almost like a slap in the face. Halsall’s statement did this regarding the need to evaluate evidence on its own merits first before turning to other evidence be it textual or, as with this article, a preconstructed model. These made it on my most influential books list for those reasons. Yasin, Ann Marie, “Reassessing Salona’s Churches: Martyrium Evolution in Question,” Journal of Early Christian Studies 20(2012), pp 59-112. I’m basically reblogging this from Research News in Late Antiquity. On Friday, May 4 the Oxford Centre for Late Antiquity will launch their Statues of Late Antiquity or LSA online database. Once it’s active (it isn’t yet but part of my reason for posting this is to remember to go back and look at it) the database will be located here. The project is funded by the Arts and Humanities Research Council and headed by R.R.R. Smith and Bryan Ward-Perkins. This looks like it might be pretty good. You can read more about it at the Last Statues of Antiquity Project page. The project will focus on new statuary, not renovation and appears to have the boundaries of the Roman Empire as its focus (though I couldn’t find this flatly stated – for example, based on the project descriptions, including research method, I can’t exclude the possibility that Roman-influenced statuary found outside the Empire or statuary created within the Empire but exported to other regions may be included). Statuary and inscriptions are areas I’m just beginning to look at. The whole concept of the role public acclamation and image making played in governance of the later Roman Empire seems pretty important to me, at least in some regions. This project and database may be very useful in looking at this, particularly since the project goes beyond simply listing statues and inscriptions and will include contemporary literary references/copying as well as modern analyses. I’m back from DC and woefully behind on reading other blogs, as well as posting. As I forget how to speak Politician, I found an article posted by Paul Halsall to Mediev-L. Many of you will know Paul as the founder of The Medieval Sourcebook. He is now at the University of Manchester. The article, by Claire Berlinski, discusses the issue of a badly needed new transit system in Istanbul where construction has run into a historical site of major importance. This is something I’ve often thought about and discussed with friends (even in our culture, which has existed in place for about two centuries, we run into this). Ultimately, every piece of land in the world has existed for far longer than modern society and has the potential to reveal a site of historical significance. As the world’s population increases and the need for land becomes more urgent, how will we balance this with historical preservation? This is by no means a new issue and there are systems in place in many areas to address this, in some places even approaching the ideal which would be to change the title of this post to History With Progress, but this article is quite good at illustrating it. There are aspects of the study of the middle ages which I know are important but I don’t know much about – and don’t feel I need to know. I always hold up numismatics and philology as examples. I don’t need to know the details of how those folks go about their work to understand the significance of a coin find or how, exactly, a researcher determines when a change in word usage signifies a major societal shift to understand its significance. I’ve never fit archaeology into this category. I can sit through a K’zoo session on archaeology and follow the discussion perfectly well, even enough to ask a question if I feel the urge. When it comes to Late Antique burial patterns and practices, this is not true. I know how researchers go about a dig, roughly. What I don’t have is a clear enough handle on how they reach their conclusions. I had no idea this was a problem until last fall when I read Guy Halsall’s Barbarian Migrations and the Roman West, 376-568. At several points in the book Halsall delineates the argument over whether burial ritual can be taken to indicate the presence of Barbarians settling within the Empire in the 4th century. (153-61) That was an eye-opener, as was his discussion of archaeology and ethnogenesis. (466-68) What was interesting was how Halsall provided a strong, powerful argument in favor of his views – many of which contradict those of Peter Heather, who also presents a strong, powerful argument. From that point it was clear to me that, when I found the time, I would have to dive into the issue of how people were buried in Western Europe from the 4th through 6th centuries, and the significance of the finds. The differences between Halsall and Heather are important and I want to figure out what I think, whether that means I fall into one “camp” or the other, or somewhere else. So a couple of months ago I picked up several books on the topic and looked for some journal articles. The first book I opened was Bonnie Effros’ Merovingian Mortuary Archaeology and the Making of the Early Middle Ages. I’m not typically a big fan of books which spend a great deal of time on historiography though it shouldn’t be ignored either. However this topic is very intertwined with 19th and early 20th century research. My comments on this book will be brief – my ignorance regarding the topic will keep it that way. Also, the first 118 pages covered the evolution of studies of burial finds. I’m not going to track that other than to say it was comprehensive and well done, detailing the research done on burial finds from the High Middle Ages to the present and how she believes that many of the conclusions of previous researchers, particularly regarding ethnicity, are unsupportable. I could almost sum up the final two chapters as Effros saying, “Those grave goods – they likely don’t mean what you think they mean,” in conjunction with, “Be careful about assigning motivation to finds,” particularly when it comes to ethnicity. I think that a couple of examples might be useful..
An example of a conclusion which, on its surface, would appear obvious is that of sexing the occupant of a grave based on the presence of weapons and/or jewelry – gender-linking artifacts. While there is a positive correlation between such artifacts and gender, detailed analysis at some sites, including DNA, has shown that this is far from perfect and frequently women were buried with weapons and men with substantial jewelry and no weapons. Another example is the case of abnormal burials. In this case the discussion centers around graves where the occupant was buried in an unusual position, such as face down or facing in a direction other than the majority of the graves and, specifically, where the head was separated from the body – or absent altogether. Initially it was proposed that these graves represented an individual who had been executed. 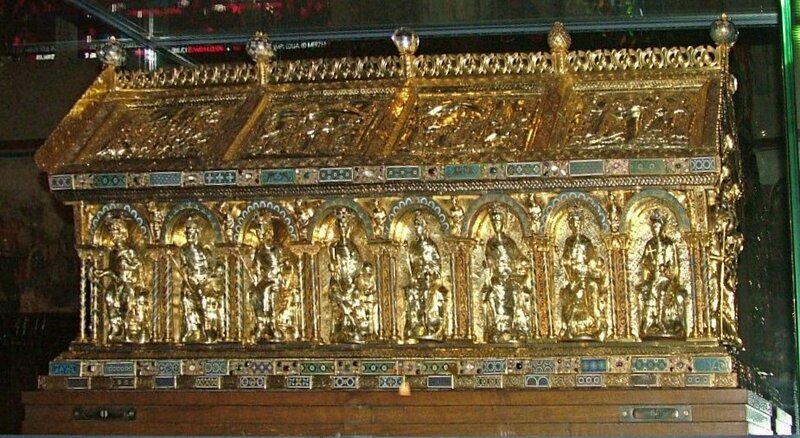 Recent investigation has found that in many cases these represent individuals whose remains had been disinterred and removed to another location, that the head had been removed from the body well after death and this was a sign of respect and even reverence, a lay parallel to the movement of relics of a saint. One area in which she believes some conclusions may be drawn is regarding the relative amount and value of burial goods. She believes that lavish burials are a sign of social competition, that by showing themselves capable of extensive burials, families were engaging in a visible show of their clout – or what they wanted others to believe was their clout. By the later 6th and 7th centuries, less extensive burials indicate an increasingly static social hierarchy, one in which such displays were unnecessary. There’s a lot of info in this book, many specific characteristics of finds which she discusses. Even so, this is something of an overview where she spends just a few pages on each characteristic. For more detailed information I need to pick up her, Caring for Body and Soul: Burial and the Afterlife in the Merovingian World. This book made a useful starting point but it’s clear that I need to read a lot more on this and I need to start going through journals, such as Medieval Archaeology. I also need more time – 30-hour days anyone? Effros, Bonnie, Merovingian Mortuary Archaeology and the Making of the Early Middle Ages. Berkeley: University of California Press (2003). ISBN: 9-780520-252440. Effros, Bonnie, Caring for Body and Soul: Burial and the Afterlife in the Merovingian World. University Park: Pennsylvania State University Press (2002). ISBN: 978-0271021966. Halsall, Guy, Barbarian Migrations and the Roman West, 376-568. Cambridge: Cambridge University Press (2007). ISBN: 978-0-521-43543-7.